"Bad choices or good, if you never take chances, someone else will build your life for you." To continue with most of the reviews I've seen out thus far, this book was absolutely 'perfect'. When I heard that Hopkins was working on a companion to Impulse I about flipped. Impulse is to date, hands down, my favorite of her Teen titles; Triangles is currently sharing the position of favorite novel, but that's a whole other review - back to Perfect. Perfect uses the voices of four teenagers from different walks of life as they all strive toward that nebulous goal of being 'perfect'. Cara, Conner's twin sister, just wants to fly free as herself, whoever that is, but is being dragged down by her ice queen mother's vision of perfection, and her brother's attempted suicide. Kendra just wants to be perfect enough to make it in the world of modeling, but how far is too far? Sean has Cara, his perfect girl, a full ride to play college baseball, the dream come true end of high school - or is it really a nightmare? Andre has money, girls, and no where to go but up; can he follow his parents wishes and still stay true to himself? Perfect to their parents, perfect to their boyfriends/girlfriends, perfect to themselves - it doesn't matter who, there's always someone who's opinion of you matters most, to achieve perfection in their eyes by any means is what Hopkins brings to the plate with this novel. 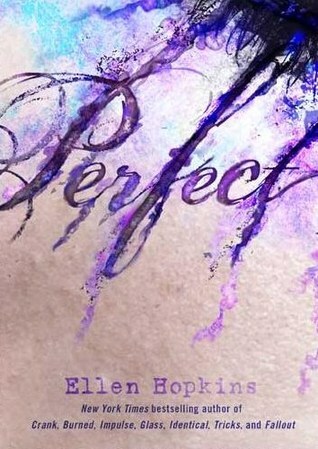 Less gritty than some of her previous novels, Perfect nonetheless is bursting with drama and heartbreak. What do you think is perfect? How far will you go to reach that point? Is there such a thing as too far when seeking perfection? Lyrical, heart wrenching, and refusing to pull any punches, Ellen Hopkins' Perfect takes you to the edge between 'imperfect' and 'perfect', and dares you to make the choice - do you believe everyone else, or yourself?